The 68-team NCAA Tournament field was announced on Selection Sunday, and one of the biggest events is sports is upon us. As you get set to fill out your NCAA Tournament bracket prior to the festivities getting under way this week, you'll want to know as much as possible about each squad vying for the national title, and we are here to help with that. Let's list out the field first, so you can get an idea of how everything falls into place when not constricted to that beautiful bracket. This is but one man's view. My ranking of every team in the field of 68, sorted by quality, talent, depth, coaching and where teams fall in multiple metrics. This is not a ranking based off resumes. This is about the best teams, top to bottom. The Cavaliers enter the NCAA Tournament as the No. 1 team in four of the six metrics on NCAA Tournament teams sheets (NET, KenPom, Strength of Record, BPI) and No. 2 in the other two (KPI, Sagarin). 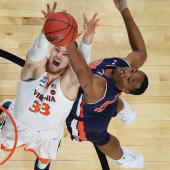 UVA's efficiency margin is comfortably ahead of Gonzaga, Duke and Michigan State. This is the best offense Tony Bennett's ever had. It's the best overall team in college basketball. And it's going to win its first two games, probably, by an average of 25 points. Gonzaga already beat Duke at full strength on a neutral court -- when the Bulldogs didn't have Killian Tillie. Now the Zags do have Tillie -- and the No. 1 offense in college basketball. Not just that, but Brandon Clarke is a top-three defender in the sport. Rui Hachimura is a top-15 player in college hoops, too. Zags are loaded. The L to Saint Mary's in the WCC title game was aberrational. This team can win the national title. The most talented team in college basketball now gets its chance to prove it's the best team in college basketball. Zion Williamson has been truly absurd the past three games, reminding the country that he is far and away the best player in the sport. Duke's leading scorer, though, is fellow frosh RJ Barrett (22.9 ppg). Throw in the streaky-but-dangerous Cam Reddish and the all-valuable point guard Tre Jones, you've got a team trying to become the first ever to rely so heavily on four freshmen and still win the national title. The 27-6 Tar Heels have one of their fastest, most enjoyable teams to watch ever. It starts with freshman Coby White, who has big hair and an even bigger game. Cam Johnson, Luke Maye and Kenny Williams are senior starters who've turned a promising UNC season into a fantastic one. UNC is trying to make its third Final Four in four years. The team that doesn't beat itself. The Vols have never had a season this good. With a 29-5 record, Rick Barnes has revived his career in Knoxville and done so thanks to SEC Player of the Year Grant Williams and senior alpha dog Admiral Schofield. It may surprise you to learn that Tennessee's offense ranks much better than its defense. For me, the difference between Kentucky and Tennessee is minimal. The Wildcats are seeded high and have their vital grad transfer, Reid Travis, back in the mix. PJ Washington, a sophomore power forward, is the team's most valuable player. Keep an eye out for freshman Tyler Herro, who is liable to hit big shots -- and certainly won't be afraid to take them. Tom Izzo's never had an offense like this. Cassius Winston, a junior, has been the best point guard in America this season. MSU assists on more of its baskets than any team in college basketball. Nick Ward is playing, which is pivotal. A top-10 team in offensive and defensive efficiency. The Cougars haven't been given enough respect all season long for their viability as Final Four and national title contenders. Remember, UH was knocked out at the buzzer by Michigan and Jordan Poole in the second round in 2017. Karma swinging back heavy in a good way for the Coogs. The Wolverines have had a great season, which started 17-0 and featured mainstream wins over Villanova, North Carolina and Purdue. It's still a top-level team. It can get to yet another Final Four. Iggy Brazdeikis is a long-distance-shooting freshman who's one of the best newcomers in the sport. And the fact that a 5-foot-10 guard, Zavier Simpson, has developed a reliable hook shot is one of the coolest things in college basketball. The 26-6 Red Raiders were bounced from the Big 12 Tournament prematurely, but don't let that dissuade you from thinking this team can win the national title. It's probably the best value bet out there. Elite defense (No. 2 in America), lottery pick (Jarrett Culver), multiple reliable 3-point shooters -- and one of the 20 best coaches in America in Chris Beard. The Seminoles are 27-7 and coming off their best season in school history as an ACC program. Leonard Hamilton's team made the Elite Eight a season ago. It might just do that again. There is no one MVP to this team. Terrance Mann, Mfiondu Kabengele, Trent Forrest, Christ Koumadje and MJ Walker combine forces to make for an athletic, imposing quintet. The Hokies have never made three consecutive NCAA Tournaments in school history -- until now. Buzz Williams' team played much of the ACC season without its best player, Justin Robinson, and yet VT was still able to land a quality seed. The Hokies rank 8th in the country in 3-point shooting and have a future pro in Nickeil Alexander-Walker. We've come to the awkward portion of the program. LSU, a good team, will almost certainly play out its time in the Big Dance without its coach. Will Wade is suspended by the university pending an investigation into purported nefarious recruiting activity. As for the Tigers' squad, it's real good. Tremont Waters is the point guard with promise, Naz Reid is a top-20 freshman in America -- and this team loves overtime. It's played in seven OT games this season. Some metrics have adored Purdue since January. With reason. The Boilermakers tied atop the regular-season Big Ten standings with Michigan State. Carsen Edwards has been nearly as good as expected this season, but he's also received more help than Purdue fans anticipated. Purdue's adjusted offensive efficiency at KenPom ranks fifth in the country. The Bulls are Final Four material. With a 31-3 record, Nate Oats has turned UB into a mid-major behemoth. To me, Buffalo's still a seed line too low. C.J. Massinburg and Jeremy Harris are a handful. What's so impressive about Buffalo is how good it is on both ends of the floor -- and yet it loves to speed the game up. It's hard to stay elite on both sides of the ball when you're pushing the pace all game. The Tigers are hoping this year's NCAA Tournament doesn't end in as embarrassing a fashion as 2018, when Bruce Pearl's team lost by 31 at the hands of Clemson. This year's group is a 3-point-shooting festival of unpredictability. Thankfully, Auburn also has Austin Wiley back. The big man is their chance to make a Sweet 16. A preseason top-10 team, Nevada's seeded lower than was expected even as recently as a month ago because of its lack of Quad 1 opportunities/wins. But this is a big team with a lot of seniors and loads of talent. Nevada made the Sweet 16 last season and it can make the Final Four this one. It's about matchups and consistency. Don't scoff because a SoCon team is ranked this high. The last time that league has a team rated well in the metrics -- this well -- a dude named Curry pushed Davidson to the Elite Eight. Fletcher Magee and the Terriers can get there too. The Terriers carry the longest win streak into the NCAA Tournament (20 games). After a rare year away, the Badgers are back in the Dance. UW is led by Ethan Happ, who has a case for boasting the best four-year career of any player in program history. Wisconsin has a top-three defense and seldom turns the ball over. It will lose eventually, but the team that does it is going to grind itself into exhausting getting there. What a weird season for Kansas, which finds itself outside the 1-3 seed range for the first time since 2006. Dedric Lawson is a beast of a player, and Quentin Grimes has come along well. Devon Dotson runs the point for KU; he's one of the fastest players in college basketball. With so many roster issues, it's kind of a wonder Bill Self coached this team to as many as 25 wins in the first place. K-State fans aren't going to be happy I ranked the Wildcats lower than the Jayhawks, not after K-State won the league. Fact is, KU ranks ahead of K-State in almost every metric. I do think it's close. I also think K-State is not the same team without Dean Wade available and/or at full strength. Talented but inconsistent team. Hey, Steve Prohm just got the Cyclones to a fourth Big 12 Tournament title in six years. I love the roster here. The question is: Which team shows up? Iowa State can make the Final Four. It can also lose its first round game by 10. I'm not sure any team in my top 30 has as much variance as this one. Strong nucleus for the Terps here. Bruno Fernando is one of the best centers in the sport. Jalen Smith is an emerging freshman with a lot of talent, someone who might well take advantage of the big stage of the NCAA Tournament to show how high his ceiling is. But for 22-10 Maryland, which has lost three of its past four, Anthony Cowan needs to play to his upper-echelon ceiling to give this team a shot at a Sweet 16. Three straight Big East Tournament championships for Villanova, which is a conference record. Jay Wright's team has two players -- Phil Booth and Eric Paschall -- carrying much of the load. The roster is relatively young. But it's Villanova. Would a run to the Elite Eight surprise you, really? Of course not. The Golden Eagles had a controversial end in the Big East Tournament, but it's time to put that away and focus on the first round. Markus Howard, Sam Hauser, Joey Hauser and Sacar Anim all shoot better than 40 percent from 3. Steve Wojciechowski's team has been sputtering as of late but is still liable to drop 15 triples in a game. Because of that, this is your Final Four dark horse. Things have gone relatively well for Chris Mack in his first year at Louisville. The Cardinals are 20-13 and rank as a top-20 defense in the country. Combine that fact with Louisville's 77.5-percent free throw shooting, and we've got a team with a shot to win a couple of games in this bracket. Sophomore forward Jordan Nwora is one of the most improved players in college hoops. The Bearcats have the defense, they (usually) have the toughness, now they have The Guy. Jarron Cumberland is a big-bodied scorer who has gotten better at putting the ball on the deck and getting to the rim. This is an old, veteran team that is impossible to intimidate. And it's been stewing for a year on its Nevada loss in the second round, which was one of the biggest blown losses in tourney history. Sort of an anonymous team, Mississippi State is in the NCAAs for the first time in a decade -- which means Ben Howland is coaching in the Dance for the first time since he was at UCLA. The Bulldogs are 23-10 and beat a number of NCAA Tournament teams. They also have the No. 14 offense in America, per KenPom. Few coaches did a better job this season than Craig Smith, who has the Utah State Aggies at 28-6 and in the Dance for the first time since 2011. Sam Merrill, Mountain West Player of the Year, leads the way on a team that is a seed line or two too low. The Huskies had a weak resume, but given the strength of their core -- Matisse Thybulle might be the best all-around defender in college basketball -- I still have to rank them relatively high. Toss in Jaylen Nowell and Noah Dickerson? Talent is there. Would not shock me if this team makes the Sweet 16. On the whole, Syracuse has underachieved this season. But that has been true in years past -- and then the Orange have made deep runs. Can we see it again? This is the tallest team in college basketball, by the way. Tyus Battle, Oshae Brissett and Elijah Hughes can thrive, so long as 6-5 senior point guard Frank Howard orchestrates to top potential. One game shy of winning the Big East Tournament, the Pirates have been one of the 10 best teams in the past three weeks in college hoops. Myles Powell has grown into a program great, and wouldn't you know it: the Hall is in the NCAAs for a fourth straight year. Iowa is an up-and-down team. Iowa has a quality offense and good bigs down low. The Hawkeyes have a lot of flaws, though, and this is a program that hasn't been to the Sweet 16 in 20 years. Ending that streak this season will be a tough order. Wouldn't be here if not for knocking off Washington in the Pac-12 final. Now that the Ducks are dancing again, keep an eye out for sophomore super-defender Kenny Wooten and junior MVP point guard Payton Pritchard. Well-timed appearance for Dana Altman, who just got a contract extension. The Gators are a mess on offense but do have the size and athleticism to muck up many a game. Mike White has UF in the field for a third straight season. At just 19-15, the Gators are a hard sell, but KenPom has rated this team top-30 most of the year. The Sooners are the only team in college basketball that did not play a Quadrant 4 game this season. That's the biggest reason why they're in the field. This group is about the same this season, on the whole, as it was a year ago. The differences: last year Trae Young was involved. This year the defense is miles better. The Knights ensured the American would get at least three teams into this year's field. It's the first NCAA Tournament since 2005 for the program. Tacko Fall, one of the tallest people on the planet (he's 7-6) is the obvious look-for guy here, but B.J. Taylor is UCF's best player and is capable of hitting a big shot late in games. Significantly good news for the Rams, who squeak into the field despite a concerning loss in the A-10 quarterfinals to Rhode Island. Most importantly, Marcus Evans, the team's best player, is healthy and able to play. The Rams are 25-7 and have the No. 7-rated defense in college basketball, according to KenPom. The Bruins rightfully got the call-up, evading bid thievery and convincing the selection committee that a 26-5 record with 12 road wins and a 5-3 Quad 1/2 mark was good enough. Belmont is 0-7 all time in the NCAA Tournament. Is this finally the year Rick Byrd gets his first Dance victory? What Scott Drew has done this season is incredible. No other school in this tournament faced as many roster issues and injuries as Baylor. I don't think the Bears are that good, on the whole, but I respect what Drew pulled off. What's so amazing: this is the No. 2 offensive rebounding team in the sport -- yet Baylor was the smallest team in the Big 12. What! The Racers and Ja Morant check in at No. 40. In terms of must-watch players in this tournament, though, only Zion Williamson rates ahead of Morant. Destined to be a chic upset pick, keep in mind that Murray State has a top-four 3-point defense and a top-five 2-point offense. They've got a real shot. Credit to Chris Jans for keeping New Mexico State near the top of the list of best mid-major programs in America. At 30-4 and with a 19-game win streak, the Aggies will rightfully be one of the three or four most popular upset picks of the first round. St. John's is a talented but erratic team and has the lowest NET ranking (73) of any at-large team. Shamorie Ponds, Mustapha Heron, Justin Simon and Co. have great potential. They're not a bad sleeper candidate for a couple of wins here. But the inconsistency looms large. At least Chris Mullin finally got his team into the NCAAs. The Buckeyes are a one-dimensional team: Kaleb Wesson is that dimension. This was never more obvious than in the final three games of the season, when OSU went 0-3 without Wesson and looked listless in the process. The Buckeyes get it done with defense, largely, and Chris Holtmann is a tremendous coach. The Rebels are among the biggest overachievers in the field -- and Kermit Davis has done an outstanding job in season one with the program. The Rebels are 20-12 and have a super-fun trio of guards Breein Tyree, Terence Davis and Devontae Shuler. Good offense, good team from the foul line. The 21-13 Golden Gophers have one of the best double-double guys in college basketball in Jordan Murphy. But this is a poor offensive team, one of the worst shooting teams in major-conference college hoops. Keep an eye on Amir Coffey, who has the talent to combine with Murphy and keep them in the game against many a superior opponent. Poor metrics couldn't keep the Sun Devils out of the NCAAs. Bobby Hurley's team has talent, no doubt about it: Freshman Luguentz Dort is an athletic marvel who is still a bit raw but all the way fun. Zylan Cheathem, Remy Martin, Romello White: all good. Sun Devils love to run. Unpredictable team, but fun. Fran Dunphy's final season coaching Temple concludes with a poetic appearance in the NCAAs. Temple is 9-4 in games decided by six points and under. One of only two teams to beat Houston this season. The universe has a way of balancing out. Some talented SMC teams in years past, better teams than this one, didn't get at-large bids. But the Gaels stunned Gonzaga in the WCC title game, so here we are. Randy Bennett's squad is slow-tempo and doesn't allow opponents to take many 3-pointers. Not a bad combo for squeezing out an upset. The Flames are in via the Atlantic Sun Tournament automatic bid and have a bruiser in Scottie James, who has the potential to trend on Twitter for the way he plays and how unafraid he is to get into the muck. This is Liberty's third NCAA Tournament trip this century. Yeah, I've got the Catamounts, out of the America East, this high. John Becker's got a potential future NBAer in Anthony Lamb, plus a strong 3-point-shooting senior in Ernie Duncan. Catamounts can bounce around the room and crash the defensive boards as well as anyone in America. Could be the best UVM team since the '05 group that knocked off Syracuse. Bill Coen's Northeastern Huskies won the CAA automatic bid and have what I think we're going to call the #CAALuka in Vasa Pusica, a Serbian senior shooting guard who was the best player in his conference. Pusica shoots 84.3 percent from the foul line, 58.2 from 2-point range and 40.1 from 3-point range. Talk about a dangerous double-digit seed. The Anteaters of UC Irvine are 30-5 and have lost once in 2019. The Big West reps have the No. 1 2-point defense in college hoops -- and only allow their opponents to take 3s a third of the time. That's a low rate. Great value for a Cinderella here. Won at Texas A&M, beat Saint Mary's, beat Montana this season. Yale was the best team in the Ivy League. It won the Ivy League Tournament, thanks in no small part to having the four-team playoff cycle through New Haven, Conn., and be played on Yale's campus. James Jones' team has Miye Oni, a junior wing with a great shot who the Bulldogs' offense click. John Brannen has built NKU into a Horizon League power; this is the Norse's second NCAA trip in three seasons. Drew McDonald is the 6-8 handful, a senior stretch big who can cash 3-pointers, trash you on defense and make way for his teammates to score from all over the floor. ODU coach Jeff Jones is the feel-good story of the NCAA Tournament. Prior to the season, Jones revealed he was battling prostate cancer for a second time. His Monarchs are 26-8, were the best team in C-USA and have a pair of fearless guards in 6-2 Ahmad Caver and 6-5 B.J. Stith. Oh, heck yes. Georgia State and Ron Hunter are back in the NCAAs. Hunter's chair-fall in 2014, when his team upset Baylor, remains a top-five NCAA Tournament highlight this decade. The Panthers come out of the Sun Belt; they beat Georgia and Alabama this season. It all ended up working out well for Travis Ford's Billikens. This is a team that was expected in the preseason to be here, but it's been a bumpy ride; SLU needed four wins in the A-10 tourney to get to this point. Jordan Goodwin and Tramaine Isabell make for a nice backcourt combo. Cresting back into the NCAA Tournament are the Colgate Raiders, who last made the field in 1996. The Patriot League representative is in the midst of the winningest single season in school history. Jordan Burns is a bad, bad dude. The 26-8 Grizzlies aren't a big team, but they're loaded with vets. Montana's offense is fun to watch because the guys know what they're doing. This is the second-oldest team in the tournament, behind Nevada. The list of men who have coached their alma mater to the NCAA Tournament is a proud but relatively short one. Abilene Christian's Joe Golden is on that list. The Wildcats are in just their sixth season of Division I but won the Southland Tournament and are 27-6. Brian Wardle's Braves navigated through the Missouri Valley Tournament by upsetting last year's NCAA Tournament darling, Loyola-Chicago, then knocking off Northern Iowa in the title game. It's the school's first NCAA Tournament appearance since 2006. This is a slow, grind-you-down team. This is a Dance debut for the Runnin' Bulldogs, who have been in Division I nearly 20 years. Tim Craft and his team earned this trip: they won at No. 1 Campbell and then won at No. 2 Radford in the Big South Tournament to break through. Tim Cluess has done the unprecedented in the MAAC by winning four consecutive league tournaments. These Gaels aren't as good as previous iterations at Iona, but that offense is still fun and still gives them a puncher's chance. The Panthers were the top team in the SWAC, and in fact they enter the NCAAs as one of the hottest teams in the country. Prairie View A&M has lost once in 2019. At 22-12, it's one of the better SWAC teams in recent memory. Greg Herenda and the Knights represent the Northeast Conference. FDU makes 40.5 percent of its 3s, which is top-five in college basketball. Fairleigh Dickinson won 17 of its 18 games in Quad 4. A surprise entrant out of the Summit League, the North Dakota State Bison take almost half of their shots (48.2 percent) from 3-point range. It's the school's fourth NCAA trip in history. LeVelle Moton has made a habit of putting the Eagles -- who rep the MEAC -- in the NCAAs; this is NCCU's fourth trip in six seasons. This is also the team with the head coach who said he wants ZERO part of Zion in the tournament. Gotta respect that honesty -- and it worked!